" RAID Data Recovery Service for all RAID Arrays"
We also have at our disposal some of the best RAID recovery technicians in the market today. We have the ability to repair your RAID array even if you have dropped 2 or 3 drives or if you are suffering some form of physical drive failure. In fact just about any data loss scenario you can think of we have faced it and successfully recovered valuable company or personal data. We have not just one but a team of specialists dedicated to working on RAID failures. Lets take a second to explain the different types of RAID setups. Please do your best to identify your setup, this will aid our technician give you accurate information when you discuss your recovery with him. In a RAID 1 (known as mirroring), each disk is an exact duplicate of all other disks in the array. During the write process data is sent to all disks in the array. However, when a read is performed, it only utilizes one disk. A RAID 1 array normally contains two disk drives. It is however possible to have more then just 2 drives. RAID 2 is rather obscure array type, and is not widely used. It is more efficient in regards to space then RAID 1, but there are other more effective RAID levels that overshadow the RAID 2. Instead of using a basic parity to check data, it uses a system called a "Hamming Code". A Hamming code is a bit larger than a parity, so it takes up more disk space, RAID-2 is the only simple RAID level that can retain data when multiple drives fail. RAID 3 is defined as bitwise, striping with parity. Every read/write to the array will access all drives in the array simultaneously, regardless of the type of access During a write, RAID 3 stores portions of each block on each of the drives in the array. It also computes the parity for the data, and writes it to the parity drive. This drive is often referred to as the "Hot Swap" RAID 3 does have some configuration limitations. The number of drives in a RAID-3 configuration must be a power of two. The most common array setups will have either four or eight data drives. RAID 4 is described as block-wise striping with parity. In this RAID parity is always written to the same disk drive. This creates contention for the parity drive during write operations. For reads, and writes, RAID 4 will perform much like a RAID 0 array with an equal number of data drives. These RAID types are often overshadowed by the better performing RAID 5 Array. RAID 5 is one of the most widely used configurations available. It is defined as blockwise striping with parity. This array differs from RAID 4 because the parity data is not always written to the same disk drive. Parity is in fact split up over all drives in the array. This allows for faster performance during multiple read/write operations. This makes the RAID 5 ideal for business level use where multiple clients are accessing data at the same time. As you can see there are a multitude of configurations for RAID arrays and we have worked with all of them. We have even been successful recovering data from servers that have water or fire damage, power surges, lightning strikes, you name it we've seen it. We provide forensic data recovery services for RAIDs. Be it for legal proceedings, or maybe you want to find out how your employees are using their computers. You can rest assured knowing all client data and contact information is kept completely confidential, and covered under a strict non-disclosure agreement. Your privacy and security are our top concern. 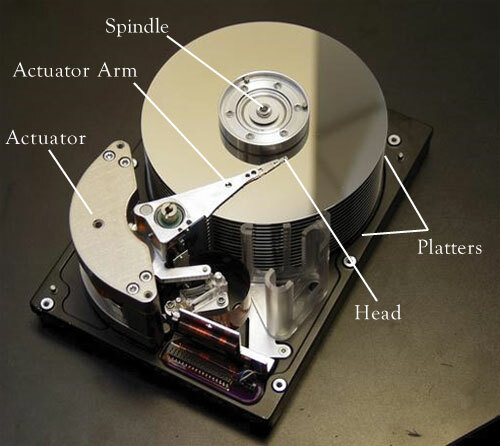 Our team is very skilled at repairing drives that have some sort of physical damage as well. Any number of issues can cause a physical disk failure, problems such as clicking or tapping sound emanating from the drive or if the drive will not power up and spin, even hard disks that have been damaged by fire and water. Our repair technicians have over 20 successful years in the data recovery business and are ready anytime day or night to make sure you get your valuable data recovered in the absolute quickest time possible. We offer a full class 100 clean-room for all physically damaged hard drives. You can rest easy knowing your drive is in the proper hands.